Around 86% of properties in Wales are beyond the reach of the average first-time buyer, according to a new survey. The figure is up from 62% two years ago, according to research released by mortgage lender Halifax. The report also found the average house price paid by first-time buyers in Wales rose by 25% last year. The rise was the UK's second largest in 2004. 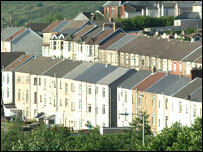 But the south Wales town of Aberdare is still one of the 10 most affordable. The Cynon Valley town, where the average house price is around £85,000, joins places like Lochgelly in Fife, Scotland and Nelson in Lancashire in the "most affordable" category, according to Halifax's First Time Buyer Review. At the other end of the scale, Gerrards Cross in Buckinghamshire was named the least affordable town for first-time homebuyers. Halifax chief economist Martin Ellis said: "Affordability has become a serious issue making it very difficult for those looking to get on the housing ladder for the first time. "This is highlighted by the sharp decline in the number of first-time buyers over the past two years to the lowest level since 1981". However, he said there was some light at the end of the tunnel. The situation is expected to improve as earnings growth outstrips house price growth over the next few years making it easier for first time buyers to enter the market.